SEATTLE, Washinton — Metallica, an American heavy metal band that is known as one of the founders of the “thrash metal” sub-genre, was formed in Los Angeles, California, in 1981. 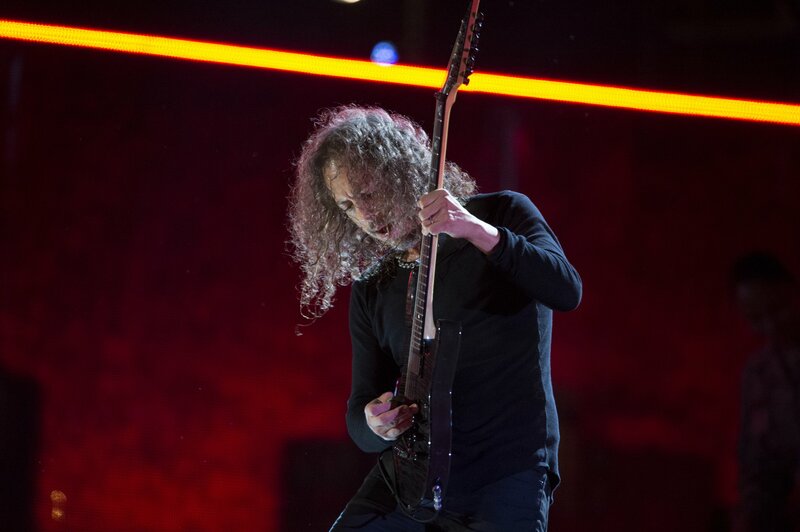 Together as a band, James Hetfield, Lars Ulrich, Kirk Hammett and Robert Trujillo have produced 15 albums over the span of 3 decades and don’t seem to be stopping anytime soon. The band’s rare musical chemistry and work drive have skyrocketed them to rock star status. But these rock stars aren’t wrecking hotels and partying all night long; Metallica gives back. Many people don’t know how much the band members have worked to help people throughout their long careers. Metallica has kept their charity work “under the radar,” according to drummer Lars Ulrich. Metallica gives back through concerts, festivals and benefits all around the world, including, the Bridge School Benefit Concerts, Live Earth, Global Citizen and Band Together Bay Area. Not only does the band play at these benefit concerts but they also donate a portion of their ticket and album proceeds to charities like the Fondation de France’s Give For France. Since 2017, Metallica has been on a three-year tour supporting their latest album Hardwired… to Self-Destruct. This tour also served as a way to announce the band’s new nonprofit foundation, All Within My Hands. Metallica gives back through this nonprofit that aims to support the people that have supported the band for years, though the main focus of the foundation is the fight against hunger. In each city on the international tour, Metallica has made donations of $10,000 to the local food banks, homeless shelters and centers for at-risk youth. Not only does All Within My Hands support local food banks through the help of Metallica’s world tour, but they also launched The Metallica Scholars Initiative with the American Association of Community Colleges. With this initiative, 10 community colleges in the United States will be the lucky recipients of $100,000 from Metallica during their tour. This money will help more than 1,000 students and will also focus on the importance of technical education. And it is not just the band giving back, the band’s tour crew has also been doing anything they can to help the homeless in any city they stop at. From the leftover catering to personal items, the crew has felt the need to help out in any way they can. When one person steps up and helps others in need, it inspires others to do the same. Though Metallica just recently announced the charity work they’ve been working on for years, drummer Lars Ulrich states that social media has played a big role in opening up about how Metallica gives back. In a Rolling Stone piece, Ulrich writes, “An unexpected added benefit to this is that we are not limited to bringing awareness to these incredible organizations on a local level, and since our social media network is so vast, this outreach gets international legs.” With the new “Days of Service” initiative, Metallica fans can help those in need alongside the band. The charities that received the donations were the Stockholm City Mission, which works with the homeless in Sweden; the World Childhood Foundation, founded by Queen Silvia of Sweden to support children that have been “victims of abuse and sexual exploitation, street children, children in alternative care and families at risk in 17 countries” and the Afghanistan National Institute of Music, the co-recipient of the Polar Music Prize. This outreach to fans is what makes Metallica unique. If you’re a rock star with thousands of people looking up to you, being a good person and helping out in any way you can be tremendously influential. Just as Metallica gives back, the band has been inspiring the fans to give back too and share their good fortune with those that need it most.